The entire castle has been well-marked, and we invite you to tour it at your leisure — without a mandatory guide. Please allow us 10 working days to organize your castle tour. 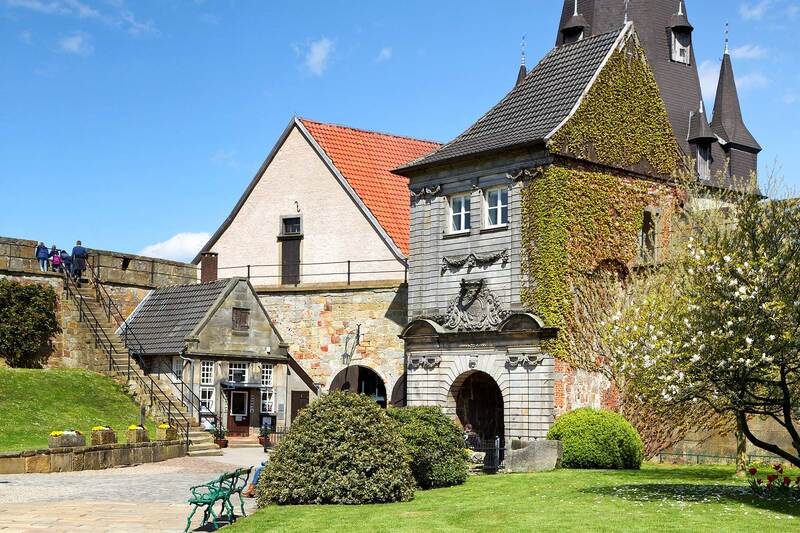 This will enable us to make sure that you will have a nice stay at Burg Bentheim. The bat hand puppet goes on a discovery tour of the castle with your kids and tells exciting stories (suitable for children up to 7 years). € 49,00 plus entrance fee per person, max. 25 persons per castle tour, duration approx. 1 ½ hours. Are you planning a castle visit with children? We offer tours for all ages. € 39,00 plus entrance fee per person, max. 25 persons per castle tour, duration approx. 1 ½ hours. Costume Tour "Time Travel 1900"
The special castle tour: Mamsell shows you the castle and tells you stories about the house and yard. Castle tours for closed groups. You want to celebrate your children's birthday at the castle? There are various offers of the Burgi Association. Every year, guided flashlight tours through the castle take place in autumn. The dates and prices can be requested directly from the Burgi Association. Take our Online-Tour up front.